Free Estimate and Contact Info. Stop annoying indoor riding arena dust once and for all! Mag Flakes applied in recommended rates to your indoor footing acts as a humectant to attract and retain moisture from the air within the particles of your footing. You need only to groom the footing on a regular basis as to keep your footing performing well and dust free for rider and horse. There are an infinite number of blends of footing materials that are used by equestrians in indoor arenas. The common problem in all footings is that they start out great, but over time quickly develop nuisance dust because the footing is pulverized by the hoof action of constant riding and pounding. Footings are a very individual thing. Some may prefer a “Palomino” mix of sand and stone dust, while others want a blend of wood, sand, and stone dust, and others want only crumb rubber or chip rubber and sand. There is no limit to the formulas of footings for each individual facility. The common denominator is that over time they ALL break down, and dust becomes a problem. Even rubber products will break down and eventually become airborne dust particles. Hunter Jumper arenas want footings that are firm but cushy while dressage arenas want a highly consistent footing with about 3-4 inches of loose footing on the surface. The US Department of Labor has some staggering statistics about the ill effects of dust and respiratory illnesses caused by it. 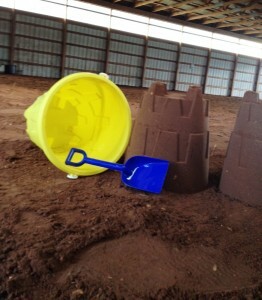 Nearly every riding arena has sand of some type somewhere in it; either as part of the subsurface or base, or as part of the footing itself. Sand contains silica, and silicosis is a well-documented INCURABLE disease that is cause by inhalation of airborne silica, or sand. Wood fibers also are a very real health problem. Consider that when the maximum permissible dust levels in the average woodshop are exceeded, OSHA or local health authorities are not only permitted but are required by law to shut down the facility until the dust is mitigated. While there are many types of dust, all dust is the result of the material becoming so finely pulverized that it can become airborne and consequently inhaled. The easiest way to mitigate dust problems is with the addition of water to weigh down the particles and prevent them from floating. Enter MAG, a proven humectant or hygroscopic agent that draws in moisture naturally. MAG is a form of magnesium chloride that is harvested from the Dead Sea, a source of life giving minerals. MAG will draw in water and then hold it at an impressive rate. One pound of MAG can hold up to four times its weight in water under ideal conditions. MAG will draw in moisture continuously and indefinitely and suppress dust permanently in any type of footing in any indoor arena. Applying MAG to an indoor ring is all art and little science. Recognizing that footings are very individual, the objective in all footings is to maintain a consistent level of loose material to provide the desired amount of give. The objective of proper dust control using MAG is to “sneak up” on the correct amount and NOT OVERAPPLY. When applying the product, always apply conservative amounts over a period of weeks, allowing ring use to mix the product into the footing to achieve the desired level of dust control. The worst thing that you can do when using MAG is to water your ring. Once you commit to using MAG, it is very important that all watering for dust control is halted. The reason is simple: You are applying a dust control agent at the surface, and gravity and hoof action will help it to penetrate the footing, coat all the particles of footing and hold them down on the arena floor where you want them. By watering after you have applied MAG, you are rinsing the product off the top and into the subsurface. The amount needed varies depending upon your ring, but generally speaking, we find that it takes 2 to 4 pallets of MAG to achieve complete dust stabilization. Once the ring is completely stabilized you NEVER need to water again. In fact, watering the ring after it is stabilized with MAG is counterproductive and only rinses the dust control agent into the base where it does you no good. We recommend a maintenance dose of approximately one pallet per year to touch up around doorways where traffic and rain may remove the treated footing, and also to combat dust arising from other materials that are added to the indoor arena such as contaminants from boots, hooves, and manure. MAG will last forever, or until you wash it away with water or add new footing. This is the most important part of any successful program; Maintenance. You change the oil in the tractor, the car, and grease and maintain all the other tools of horse management so why wouldn’t you also maintain your riding surface? We recommend that you regularly groom your riding surface with either a tine harrow or other drag-type device which will pull the footing up from the base and turn it over. Even an old piece of chain link fence dragged behind a machine will smooth out and level the riding surface. More often than not, the highest levels of dust are seen when grooming an untreated indoor ring. The best grooming devices are ones which have “teeth” that will dig into the footing and fluff it and turn it over while smoothing it out at the same time. So, regular grooming is the #1 way to properly maintain your indoor ring once it is treated for dust. Next, a small maintenance dose of MAG for use around the doorways and problem areas is recommended. The average 100 X 200 indoor ring will take three pallets of MAG to fully stabilize and then one pallet of MAG per year to maintain. Compare these costs to the costs of a sprinkler system and frozen footing in the winter. No! MAG is not a liquid – it’s dry flake form! Recently, others have begun to try to capitalize on the enormous success of our MAG. Some companies now offer a modified liquid product which appears to be a blend of unknown waste corn or agricultural chemicals and claimed to be mixed with an unknown source of magnesium. Do not be mislead by others claiming to offer the performance of our MAG magnesium chloride in liquid form. It’s impossible to have the same performance of a dry product in liquid form, even if you were to liquefy MAG and then mix it with something else. These are not MAG which is a registered trademark of Dead Sea Works and ONLY MAG offers the absolute performance guarantee for dust control in your footing. ONLY MAG products have the benefit of experience of more than 15 years of use in Europe and New England. These unknown liquids are new to the market, are unproven, and there is NO TOXICOLOGICAL DATA on them as to long term effects on equine health in legs and hooves over a long period of time. Know what you are buying and be sure to demand a certificate of analysis which certifies the minimum MgCl2 content. Our MAG is guaranteed to be 100% MgCl2, hexahydrate while liquids chemically cannot contain more than 33% MgCl2,. There are NO agricultural or distiller’s waste products in MAG; it is a pure natural product that is extracted from the Dead Sea – a source of life giving minerals. The costs of these liquids seem to average $0.15-$0.30/ft2, which is equal to about $2000 per treatment and $3000 per year on the average indoor. That is more than five times as expensive as MAG! Don’t be fooled by imposters who are claiming to perform the same as our MAG! The term “this is not rocket science” comes to mind first. Think of applying MAG to your indoor as though you are fertilizing your lawn. You want to get even, thorough coverage. To do this we recommend the use of a broadcast spreader, or rotary spreader. We have had excellent results using a Brinley 150 lb. spreader that Home Depot sells for less than $200.00. It is mostly plastic with stainless steel knife gate and application adjustments. Using a rotary spreader, fill the spreader to capacity and begin at the far end of the arena away from the “stockpile” of MAG. Spreading MAG Flakes eliminates need to water-ever! Open the spreader up to full capacity (wide open) and then begin by making a checkerboard pattern going first north and south in your arena and then east and west over the same area in a checkerboard pattern. When MAG is properly applied, it will look like it just snowed a light snow in the indoor. You will immediately see MAG start to pull in moisture and dissolve into the footing. 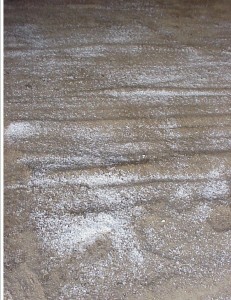 This is what it’s supposed to do and what will effect dust control. This is only the first application but because all footings are different, and dust levels vary widely, this is a starting point that is more than half way to complete control for the average indoor. Next we suggest that you “sneak up” on the final amount needed for complete dust control in your indoor. Continue to add MAG, but do so at much lower levels until you have achieved complete dust control. It is very important to not over-treat. Over-treating will result in a fully saturated, muddy, slippery, wet footing, that will compact and work against you. If you do make a mistake, and one week after treating find that you have over treated your indoor, then use a sprinkler to rinse away some of the product and drive it into the subsurface. This must be done with great care to avoid over rinsing and losing the job that you just worked so hard to do. With so many different types of footing, it is impossible to speculate about how much MAG it will take to stabilize or how much water it will take to “remove” some of the MAG that was over applied. As stated up front, this is not rocket science, and as a stable owner and barn manager, you know better than anyone that common sense is the best guide. 2) Use a checkerboard pattern to apply product evenly. 4) Thoroughly rinse down all equipment after each application.